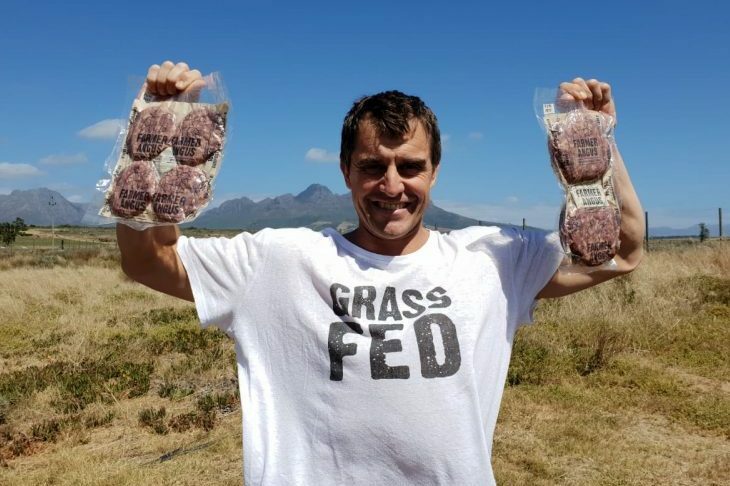 Farmer Angus is one of two grass fed, pasture-reared beef producers in the Western Cape. His onsite butchery is, however, the only one processing the beef that is produced on his farm. Biodynamic and regenerative agricultural principles and practices are applied in the raising of the farm’s animals which includes cattle, pigs, broiler chickens and laying hens, as well as vegetables and wine. Situated on 126 hectares of irrigated pasture at Spier Wine Estate near Stellenbosch, it is the only butchery in the country that does not add nitrates, gluten and nitrites to the meat. All Farmer Angus products are also 100% growth-hormone free, routine antibiotic free and the pig and chicken food is glyphosate free. The vineyards on the farm are in their 4th year of being certified organic and we are in negotiations to have the 2019 harvest BioDynamically certified. Farmer Angus has had a few world firsts. Farmer Angus beef burgers (pictured above) are the first burgers sold anywhere in the world using 100% compostable packaging. They are sold fresh and have a 2 week shelf life. This follows on from a 2013 achievement where Farmer Angus became the first person globally to sell Carbon credits for increasing the Carbon contents of the pastures where the cattle graze. The sensitive pasture management of the farm is based on the high density grazing methodology or “mob-grazing” espoused by Andre Voison, Allan Savory and Ian Mitchell-Innes. The enormous amount of manure and urine that is deposited onto the soil eliminates the need to apply any artificial (NPK) fertilisers. The pastures were established with a variety of different perennial summer and winter legumes, herbs and grasses. 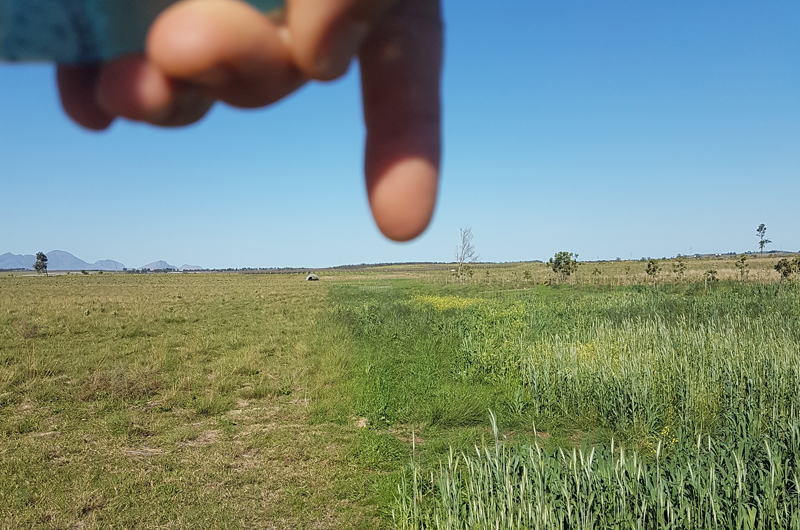 Once an area has been grazed, the animals are moved giving the pasture and soil time to regenerate and fully recover. A minimum of 6 weeks passes before the pastures are grazed again. The cattle are moved four times a day, the pigs every three days, the broiler chickens, in safe enclosures, are moved daily and the laying hens, accommodated in constructed Eggmobiles, are moved daily. What this ultimately encourages is: beef, pork, chickens and eggs that are 100% nutritious and natural. The way nature intended it to be. 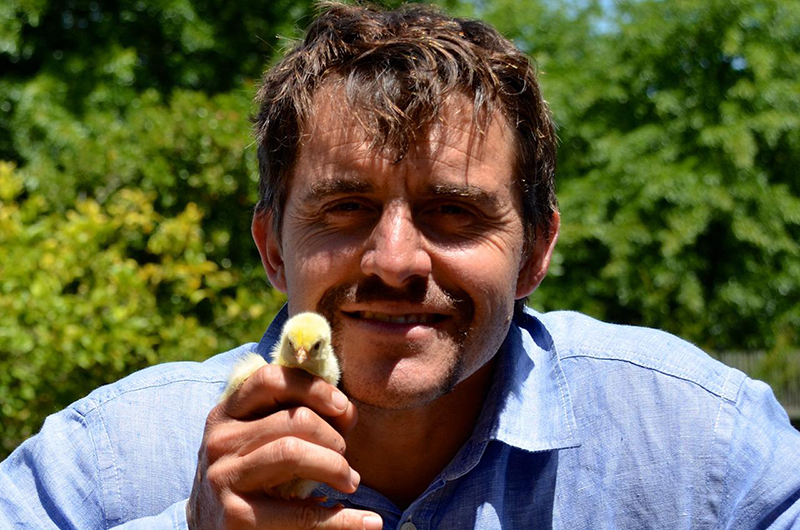 Angus McIntosh is Farmer Angus. He grew up on a cattle ranch in Kwa-Zulu Natal. Studied Management Accounting at Stellenbosch University before stockbroking for Goldman Sachs in London for just over four years. Declined the offer of promotion, left his job and moved to South Africa. Built a clay home with inspiration from various people on the way leading to him to eventually become a biodynamic student, grass farmer and carbon sequestrator. “After reading about Joel Salatin of Polyface Farms in Virginia, USA, in Michael Pollans’ “The Omnivore’s Dilemma” Angus decided to become a farmer. Under the mentorship of Christo Kok, he started farming on Spier, outside Stellenbosch, South Africa, in December 2008.